In 2018 total assets of United Bulgarian Bank AD were 11,270.40 mln BGN. Growth compared to the previous period (2017) was 53.35%. 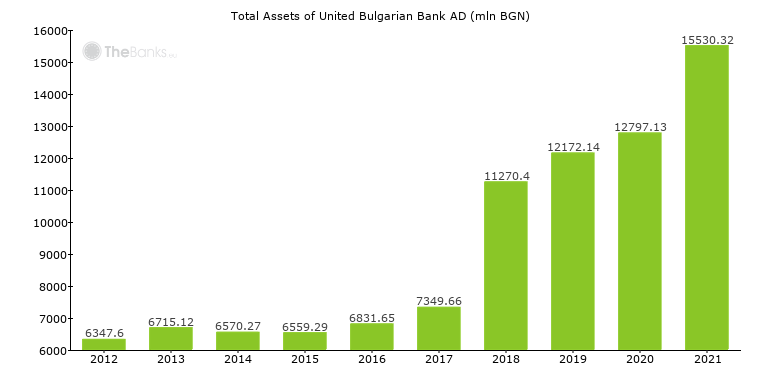 The evolution of the total assets of United Bulgarian Bank AD is shown at Chart 1 below. Chart 1. Total Assets of United Bulgarian Bank AD. Recent changes in total assets of United Bulgarian Bank AD and its main components are shown in Table 1. Table 1. Recent changes in total assets of United Bulgarian Bank AD (mln BGN). Recent changes in total liabilities of United Bulgarian Bank AD and its main components are shown in Table 2. Table 2. Recent changes in total liabilities of United Bulgarian Bank AD (mln BGN). Recent changes in gross profit of United Bulgarian Bank AD and its main components are shown in Table 3. Table 3. Recent changes in gross profit of United Bulgarian Bank AD (mln BGN). In 2018 net income of United Bulgarian Bank AD was 173.22 mln BGN. Decline compared to the previous period (2017) was -407.14%. 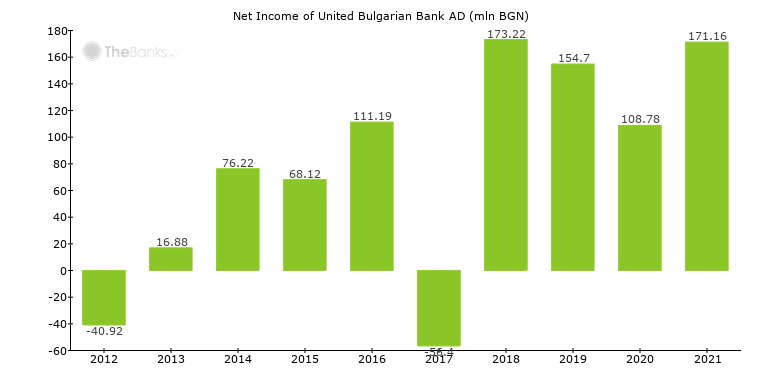 The evolution of the net income of United Bulgarian Bank AD is shown at Chart 2 below. Chart 2. Net Income of United Bulgarian Bank AD.